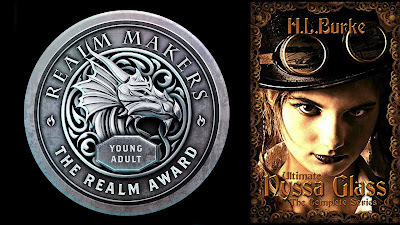 The Faith and Fantasy Alliance has created the Realm Awards to recognize the most excellent speculative fiction books written by Christian authors in the previous calendar year. I'm so proud and excited to announce that my book Ultimate Nyssa Glass is the winner of the YA Category for the 2016 Realm Awards! About a year and a half ago, I'd just finished Cora and the Nurse Dragon and was trying to decide what to write next when I got an idea for a book that was a deconstructed puzzle/adventure game ... and somehow a teenage girl popped into my mind with a snarky voice and a distinct sense of self and a compassionate determination to do the right thing even when face with impossible odds. I later realized that I modeled her after my daughter, Coryn, as I anticipate her growing up, but at the time she was just Nyssa Glass and Nyssa Glass became a current that swept me along for over a year. As a writer all my characters and stories are important, but there's just something about Nyssa (and Ellis), so seeing them now honored as the Realm Awards' Young Adult winner (beating out books that had actual publishers behind them when I'm a "doing it on my own" Indie) is incredible. Thank you everyone who followed Nyssa's journey. Thank you Jennifer who designed those awesome covers. Thank you, God, for planting Nyssa somewhere in my brain, and thank you to the designers of the Myst series because I worked this story backwards from being addicted to your adventure/puzzle games in high school and trying to dissect what made those games so much dang fun. Congratulations. That is too amazing!